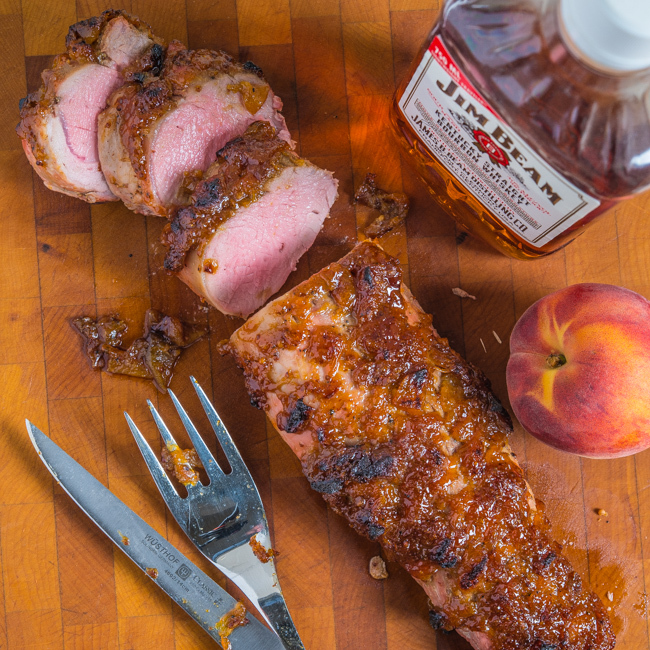 Can you imagine a perfectly cooked pork tenderloin topped with a caramelized peach, bourbon, and maple glaze? Well, that’s what I’ve created for today’s post. I’ve decided to fully exploit Georgia peaches this summer and this recipe is the second variation on a theme of pork and peaches. (I just posted Grilled Pork Chops with Peach Salsa last week.) For this dish, I wanted to create a glaze for the pork using fresh peaches instead of the more commonly used peach jam. Bourbon and maple syrup perfectly compliment the flavor of the peaches. As I was thinking about writing this post, I got curious about the origin of peaches. I found that peaches originated in the northwest area of China. Although cultivation of peaches spread to many other countries, China remains the world’s largest producer of peaches. Georgia is one of the three largest peach-producing states in the United States. And for a bit of “peach” trivia…Atlanta, the capital of the Peach State, has 71 streets with a variant of “Peachtree” in the name. I started the glaze by simmering peaches in maple syrup and lemon juice until they began to caramelize. I wanted the glaze to remain somewhat chunky, so I used a potato masher to break up the peaches. If you prefer a smoother texture, you can puree the peach mixture in a food processor before adding other ingredients. The glaze further caramelizes on the grill and creates the perfect balance of flavors for the pork. I’m not promising this will be the last peach recipe this summer. Once I get on a roll, it’s sometimes hard to slow the momentum. However, I promise not to overdo it. Give this peach bourbon glaze a try and let me know how you like it. Our good friend, Felix, one of my main taste testers gave it two thumbs up! 1. Bring peaches, maple syrup, and lemon juice to a boil in a small sauce pan. Reduce heat and simmer for 20 to 30 minutes until peaches are caramelizing. Remove from heat and cool. Mash peaches with a potato masher for a more textured glaze or puree in a food processor if you want a smoother glaze. 2. Transfer peaches to a small bowl and combine with bourbon, vinegar, mustard, garlic powder, 1 teaspoon salt, and 1/2 teaspoon pepper. 3. Preheat grill to medium high heat (450 degrees). Season pork tenderloins with 1/2 teaspoon salt and 1/2 teaspoon pepper. Top tenderloins with peach glaze. 4. Turn off one burner on the grill and place tenderloins over burner that is off. Cook for 15 to 20 minutes or until internal temperature reaches 145 degrees. Remove from grill, cover with foil, and let rest for 10 minutes. 5. Slice and serve immediately. My uncle had my husband and me over for dinner tonight and served this recipe. He roasted the pork and It was absolutely delicious. I made him share the recipe and am looking forward to making it for a dinner party in the future. Cheers! Can you use peach preserves instead? I am SO making this!!! I’ve got everything I need and can already taste it! Thanks Bill! I am heading to visit my family in South Carolina in a couple of weeks. It will be be at the height of peach picking season and I’ve been longing for a juicy, just-picked peach. I’m definitely bringing some back home with me and will be making this! Thanks for the inspiration and a great post! You had me at peaches but then pulled me in with bourbon…oh, and the pork…cant forget the pork! This looks delish – I always enjoy your posts! p.s. my husband is a bourbon ambassador for Markers Mark – has his name on a barrel and everything – love a little cup of brown! Or maybe there is another baked recipe on your site that would be similar to this. Thanks. Hi Bert, you could definitely cook this pork recipe in the oven. I would suggest 375 for about 20 to 30 minutes. Make sure an use a meat thermometer so you don’t overcook. I like it at 145 degrees which is still a little pink. If you like it more well done, i would suggest 150 degrees. Let me know how you like it. Boy, that tenderloin is perfectly cooked! Love pork and fruit, and peaches are one of my favorites. And anything with bourbon has to be good, right? 😉 Really nice — thanks. A glaze made “by simmering peaches in maple syrup and lemon juice until they began to caramelize” Bill – that’s just BRILLIANT – this glaze is simply BRILLIANT – I think you need to sell this glaze – it would be awesome on chicken or turkey or anything…wow! I am blown away – please keep the peachy recipes coming! This looks like it is filled with amazing flavor! Love this!